Lynn Ghahary :: Pieces of Me ...: Collage Press Sketch Contest! Hi everybody! Sorry for the long absence between posts - I am still trying to adjust to having the boys home from school all day. Definitely doesn't leave much time for anything crafty that's for sure! LOL! I did want to share with you a layout I created for the Collage Press blog. We are currently having a sketch contest over on the Collage Press blog (see details below). For this layout about my little guy Brandon I used my favorite Collage Press collection Knave of Hearts. I kept my design pretty close to the sketch which helped me create this layout in no time at all. My little guy is definitely a mama's boy and I feel so very lucky to be able to call myself his mama and that he loves me the way he does. I used the "lucky" die cut for my main title popped up with some dimensional adhesive and placed on a journaling die cut. I slightly overlapped my title block with the bottom of my main photo to help ground all of the elements. Since my layout is about love I decided to add a couple of hearts. I punched these hearts from a few different patterned papers, zig zag stitched down the centers, and folded up the edges for a bit of dimension. We'd love for you to play along with our sketch contest as well. To enter simply create a layout using the sketch posted here. The topic can be whatever you choose -- the only rule is that you must use 80% Collage Press products. E-mail us a copy of your layout to cpsketchcontest@gmail.com by midnight PST on June 30th, and our design team will choose a winner to be announced July 5th. The winner will receive a Sweet Shoppe Collage Crafting Kit, which includes patterned paper, die-cuts, two alphas and more! Good luck! Love the stitching and your hearts..such a cute layout! i love love how you did those hearts...beautiful! 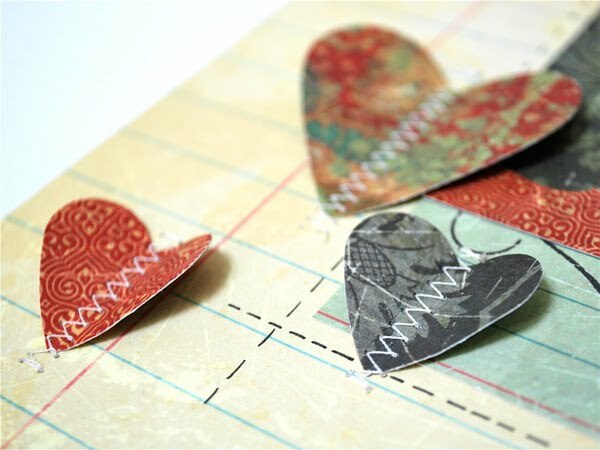 Love those little stitched hearts! Love those stitched hearts Lynn. I've gotta try that. What a lovely design, Lynn. Your little guy is adorable! What a lovely layout! Those hearts are adorable! totally in ♥ with that layout! Gorgeous!